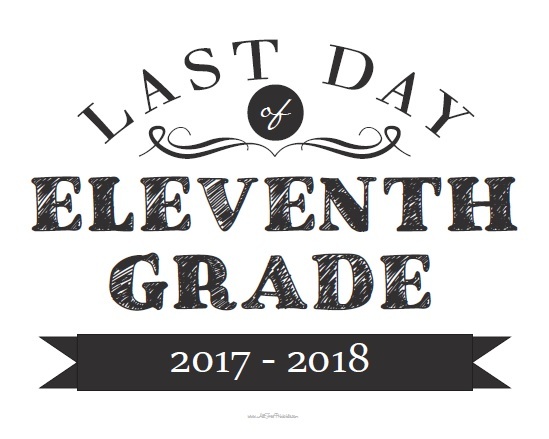 Free Printable Last Day of Eleventh Grade Sign. Free Printable Last Day of Eleventh Grade Sign to celebrate the end of school year. A school year full challenges that ends and happy parents can document it with a beautiful photo. Kids are growing up and moving on to a new grade or college next school year, this is for sure a moment to remember. I just needed to do a couple of first day of school signs for my kids this 2017-2018 school year. I started with Kindergarten and 5th grade first day of school signs but I ended up making all signs from Preschool to Eleventh Grade and also made matching Last Day of School signs as per your request. Download Free Printable Last Day of Eleventh Grade Sign now in easy to print PDF format.